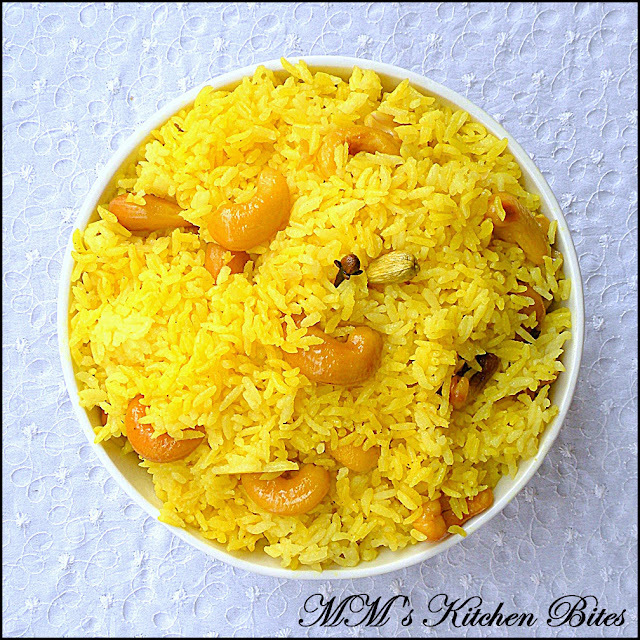 MM's Kitchen Bites: Mishti Pulao/ Bengali Sweet Pulao …love at first whiff!!! Heat the ghee in a heavy bottomed deep pan. Lower the heat and add green cardamom, cloves, bayleaves and cinnamon. When the spices start to sizzle, add the cashews (and raisins, if using). Fry on low flame till the cashews turn light golden brown on each side – be careful, so that the cashews don’t burn. Add in the ginger, turmeric and fry for another 10 seconds or so. Add in the drained out rice. 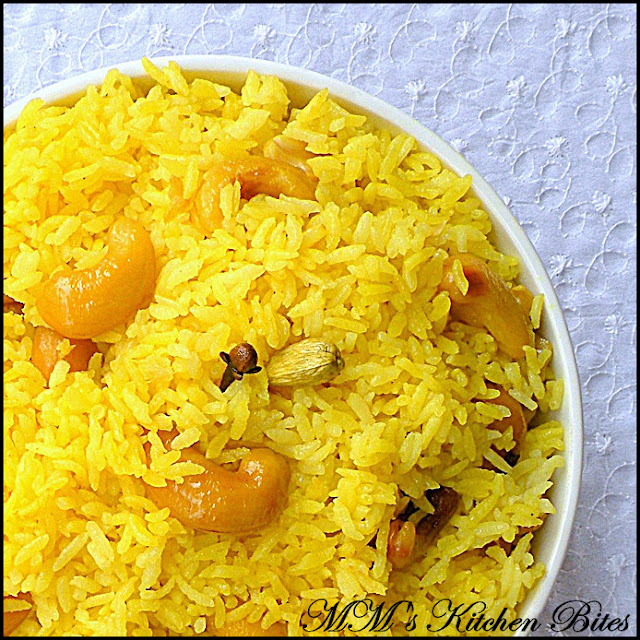 Gently mix everything so that the rice gets nicely coated with ghee – do the mixing gently so that the rice grains don’t break up. Still on low flame, fry the rice for 2-3 minutes – though, don’t let the rice colour. Add in the water now and increase the heat. Add in the salt and sugar. Give a final stir. Goes best with Kosha Mangsho (Bengali Dry Fried Mutton), Cholar Dal (Bengali style Split Bengal gram curry), Robibarer Murgir Jhol (Bengali Sunday Chicken Curry ) or just fill up big huge bowl and dig in! !